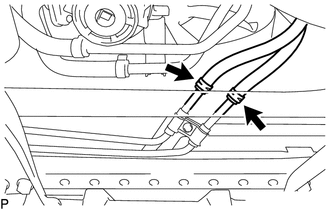 When disconnecting the hoses from the tube, support the tube by hand and be careful to prevent the tube from being deformed. Use a container to catch any ATF. (a) Disconnect the No. 1 oil cooler inlet tube and No. 1 oil cooler outlet tube from the automatic transmission assembly. (b) Slide the 2 clips and disconnect the No. 1 oil cooler inlet hose and No. 1 oil cooler outlet hose from the No. 1 oil cooler inlet tube and No. 1 oil cooler outlet tube. 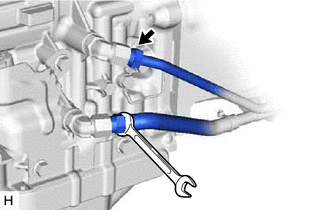 (c) Remove the bolt and flexible hose clamp from the automatic transmission assembly. 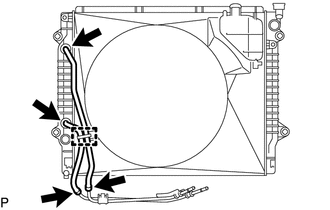 (d) Remove the 2 bolts to open the 2 oil cooler tube clamps and remove the No. 1 oil cooler inlet tube and No. 1 oil cooler outlet tube. 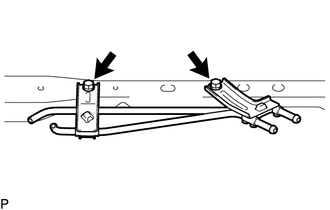 (e) Remove the 2 bolts and 2 oil cooler tube clamps from the engine assembly. (a) Slide the 2 clips and remove the No. 1 oil cooler inlet hose and No. 1 oil cooler outlet hose from the oil cooler tube. (a) Detach the claw to open the clamp. (b) Slide the 2 clips and disconnect the No. 4 oil cooler inlet hose and No. 4 oil cooler outlet hose from the oil cooler tube. (c) Slide the 2 clips and remove the No. 4 oil cooler inlet hose and No. 4 oil cooler outlet hose from the radiator assembly. 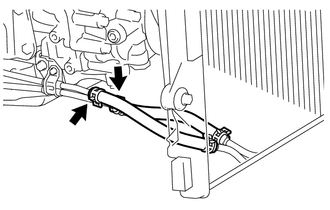 (a) Remove the 2 bolts and oil cooler tube from the vehicle body.